Dahlgren Mortars. Custody of 170 munitions was transferred from the US Navy to the US Marine Corps and then to the MRE team for inerting using MuniRem - a patented technology. The MRE team was composed of a Senior UXO Marine, UXO QA and Safety Navy Senior Chief, Senior Chemist and Chemical Engineer. A MRE process was successfully applied to remove the main charge and the threat of a detonation and fragmentation of the munitions safely without disturbing the most hazardous part of the munition (the fuze). 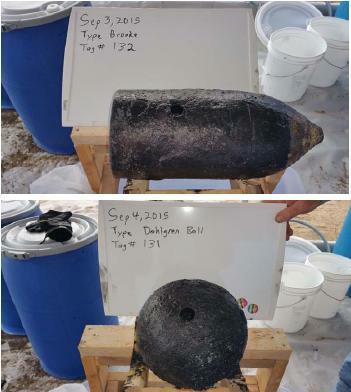 Thereafter, the amount of explosives remaining within the projectile was contained within the fuze. Subsequently, the fuze was rendered safe by unscrewing and inerting in MuniRem solution or drilling directly though the fuze body to access and neutralize the explosives again using a solution of MuniRem. All explosive material flushed from the munitions was fully neutralized with MuniRem solution for safe disposal as non-hazardous waste. An automated remote disassembly line utilizing a combined chemically enhanced hydro mine process provides a unique safe and environmentally friendly non-thermal alternative solution for demilitarization. 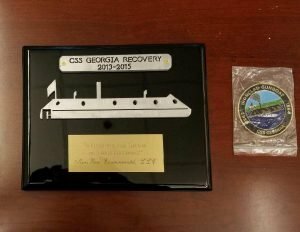 Custody was passed back to the USACE with the munitions now safe for shipment on public roads. 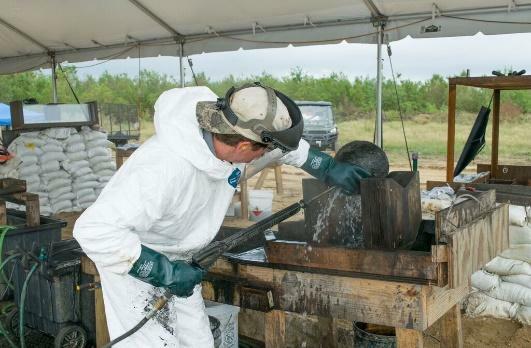 The munitions will be conserved by the University of Texas and distributed to museums around the country.